On the evening of the 11th of July 2011 I observed Cambridge’s South Area Committee hold a session on the local police priorities. I submitted notice before the meeting started that I wanted to use the public speaking slot, to comment on policing. The police item was taken first, after formalities including election of chair and vice chair, accepting the minutes of the previous meeting, and declarations of interest from councillors. Cllr Swanson’s absence due to the fact she was on holiday was reported. About thirty people were in the public seating, many were council officers, police officers or staff, or members of the public who had come for specific planning or other agenda items. Why is the popular, well used website Police.UK not being used by Cambridgeshire police to publicise the area committees at which police priorities are set by councillors. Why are the police promoting police surgeries instead? I noted that elsewhere the system is used to promote police priority setting meetings, and the Community Safety Partnership had asked for it to be used in this way within the city. What has happened at the police surgeries in the South Area during the period under review? Are there any suggested priorities coming out of them? I noted that the police report did mention the surgeries held at Waitrose, but not others such as those held in the building we were in (Cherry Hinton Village Centre). Why is there no breakdown of the violent crime figures. Previously councillors at the South Area committee, like councillors elsewhere in the city, and priority setting groups elsewhere, had asked for domestic violence to be separated from the overall violent crime figure. I also said I would like to see a breakdown of violent crime involving strangers on public spaces (as opposed to violence between those who know each other). I also took the opportunity to point out the presence of Police Authority member Ruth Joyce (an unelected appointee) who was hiding at the back of the room, and had not introduced herself. This prompted her to admit her presence, and state she was: “not hiding, just taking a back seat”. Inspector Kerridge of Cambridgeshire Police responded. He said he was present because the neighbourhood sergeant was not. Inspector Kerridge said he would “take away” the point relating to police.uk and look into why it was being used to promote some, but not all, meetings. He claimed that if ideas for priorities were raised at surgeries they would make the police report (the neighbourhood profile document) but said people often used surgeries to raise personal matters rather than those in which there is a more general public interest. On violent crime, he said that “all sorts of very different crimes” come under the heading; he promised to break the figure in the report down verbally when he came to it in his report (in the event he didn’t), he said providing the breakdown in the written reports was something “we don’t do routinely”. He said he was confident to state there was a very low level of stranger violence. The police report is available online. Inspector Kerridge started off by introducing neighbourhood policing and the priorities which councillors were to set. He, rather superfluously, said that the police were a 24/7 service, but went on to describe the priorities being discussed as a “top up” to that underlying basic service. The inspector also spoke about changes to city centre policing, saying the aim was to put “more yellow jackets” on the streets for the night time economy. Turning to the South Area he reported there were no major crime trend and a very good decrease in crime levels in most crime areas compared to the same month in previous years. He drew out some significant sections of the report. Inspector Kerridge made very clear the councillors were free to set whatever priorities they wanted; and explained that the following week a group of officers from the police, council and other bodies would meet as the “Neighbourhood Action Group” and set “Action Plans” to approach the priorities set. He explained how the police would return to the committee with report on progress which councillors could hold them to account in relation to later in the year. I thought this was one of the best introductions to a police priority setting meeting I have seen. The Inspector tried to cover items of wider interest to residents of the area – by commenting on the city centre, and made clear what councillors were being asked to do, and how the police, with others would act on it. When mentioning vandalism to vehicles the Inspector appeared perhaps to have been reading my website, as he made clear he understood the costs involved, not only directly in repairing damage but in increased insurance premiums. When he spoke about the low level of burglary, only 7 in Trumpington, 4 in Queen Ediths and 6 in Cherry Hinton in the February – May period – figures substantially lower than they have historically been in the south, and substantially lower than the level accepted in the North of Cambridge, he was careful to note that for those who’ve suffered those burglaries, even though the statistics are improved those are significant crimes and there is still work to do. Cllr Taylor asked if the public had any questions, or contribution to make following the police report. 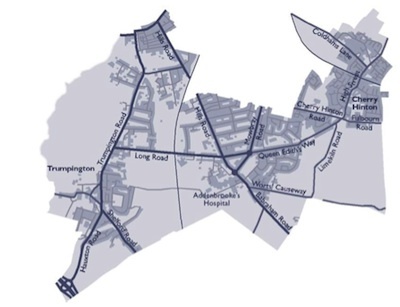 A member of the public brandished a Liberal Democrat leaflet which had invited people to come to the meeting to discuss the 20mph zone on Wulfstan Way, she said that while the police report was very interesting she was expecting, based on the leaflet, a meeting just about 20mph. She also noted there were not enough copies of the meeting papers, and in particular the police report, to go round. Cllr Taylor told her her comments had been noted, and said the large turnout of 30 or so people had been a surprise. Member of the public Mr Chisholm then asked about the survey which the Community Safety Partnership had used to come up with the city wide police priorities; he asked why anti-social use of scooters wasn’t even on the list consulted on, given that in a national survey conducted by the Home Office it had come very high up. City Council officer Linda Kilkelly claimed the Cambridge shortlist was “evidence based” and claimed there was no evidence to support the matter being a problem in the city. A member of the public told the committee how she and her neighbours living in a block of flats were having problems with drug users. She said she had to clean the stairwells and corridors of “spit and things” after people had come in and taken drugs in the areas. She said that some of her younger neighbours with young children found having people taking drugs outside their flats very alarming. She praised the police response when they were called, but said it was a recurring problem; she said those taking the drugs sometimes “had flames this high” gesturing with her hands to show a height of about 30cm. Inspector Kerridge said there was only so much the police could do; they put people before the courts, but they quickly served their sentences and came out again, it was a circle which needed to be broken he said. He wasn’t clear on exactly how this should be done, he suggested it was something the city council should be doing. Inspector Kerridge said he would take details outside the meeting and then send an officer round to “discreetly speak to those being affected, and to discuss what could be done”. Councillors then made their comments. Cllr Dryden jumped straight in asking for Antisocial Behaviour on Cherry Hinton High Street, to remain a priority and to explicitly add adjacent areas including Arran Close and to note scooter misuse as one of the aspects of ASB which needed to be tackled. Cllr Stuart raised a specific individual case of a resident reporting on-going repeated unspecified “ASB” from neighbours. The individual reporting the ASB was a council tenant, the alleged perpetrator living in a privately owned house. Inspector Kerridge commented that had the situation been reversed then enforcement of the council’s tenancy agreement would have been an option. Cllr Stuart said the resident complaining’s view was that the perpetrators have lots of rights but residents don’t. Inspector Kerridge asked for details to be passed privately and promised a he would task a local officer who would be put in charge of dealing with the situation. Cllr Heathcock followed up my request for a breakdown of the violent crime figures; he specifically requested a breakdown of the 28 violent crime incidents during the period in his Queen Edith’s ward. Cllr McPherson spoke about scooters. He related what sounds like an incredible story of him encountering 14 scooters / mopeds riding on pavements / footpaths in Cherry Hinton during one walk. He also said Church End was being used as a rat run to avoid the traffic lights at the Coldhams Lane, High Street, junction – and that elderly residents of Church End had told him they really had trouble crossing the road, given poor visibility (the road goes round a bend). Cllr Taylor asked all councillors to express a view on the police priorities; encouraging those who’d not contributed to do so. A number of councillors raised the problem of scooters being misused, particularly on paths, off road in Cherry Hinton Hall and Cherry Hinton Rec; councillors suggested there may be a small group riding around the South Area (centred on Cherry Hinton) causing the problems identified in a number of places. Cllr Stuart talked about bikes being ridden on the pavement. She said she stopped some people on hire bikes on the pavement and they claimed they were not skilled enough to ride on the road to which she said they shouldn’t be riding bikes. She asked for hire companies to inform those hiring bikes of the law, Inspector Kerridge said leaflets given to language schools could also be given to the cycle hire companies. A member of the public asked to comment on the cycling on the pavement issue. She said that while she cycled on the road, the traffic calming features in the area made it dangerous for cyclists, especially if they went down the channels / gutters intended for them, which often contained with debris. She said how when she cycles down the road she often gets cars hooting at her. She noted that her friends’ trike and another friend’s tandem were not able to use the cycle paths around the traffic calming features. Others noted that one area where councillors had complained about cyclists being on the pavement – near Netherhall School was actually a dual – use pavement. Councillors commented that it was the aggressive cycling in this area that was particularly problematic – eg. cyclists particularly older school children shouting at people to get out of their way. Inspector Kerridge stated that all officers ought to stop people cycling on the pavement when they see it happening. Cllr Al-Bander noted he was a member of the probation service board, and spoke about a known offender living in his ward. He asked what could be done to control them. Inspector Kerridge said the threshold for taking action with something like an Anti-Social Behaviour order was quite high, and such a route would only be taken if behaviour became a very serious problem. The issue of under-age drinking / purchase of alcohol was raised, with Inspector Kerridge, who suggested it was an issue for Trading Standards; and indicated the concern would be passed on. Anti social behaviour on Cherry Hinton High Street, and adjacent areas including Rectory Terrace. Mini-moto etc. misuse in Queen Ediths and Cherry Hinton. A vote was held; all councillors voted in favour of the priorities apart from Cllr Christine Carter (Labour), Cherry Hinton’s County Councillor who abstained. Cllr Dryden reminded the police the Cherry Hinton re-deployable CCTV camera (run by the City Council, paid for out of money raised by local residents) was at their disposal should they wish to use it to help tackle the priorities set. Cllr Taylor asked the police to include both the violent crime breakdown and details of speeding and other vehicle crime for their next meeting. 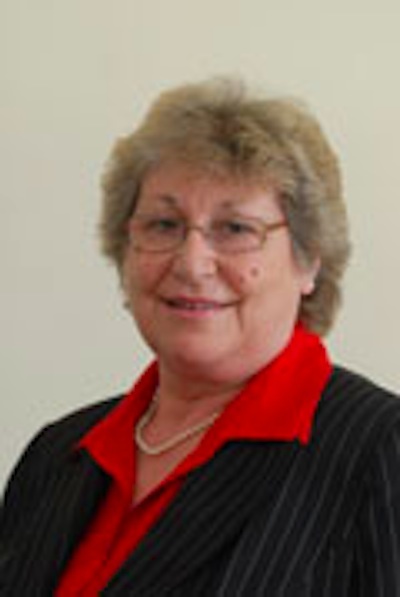 County Cllr Christine Carter (Labour, Cherry Hinton) did not speak or vote on the police priorities. During a break in the meeting later on I asked Cllr Carter why she abstained on the police priorities vote. I was wondering if perhaps she had a principled objection to councillors setting the police priorities and I wanted to understand and discuss her position with her. Cllr Carter told me that she had not voted on the police priority setting because she did not think she was able to as she was a county councillor. I told her that county councillors do have a vote on the policing priorities, both on the South Area Committee, and at the other Area Committees across the city. She insisted I accompany her as she asked the meeting’s chair, Cllr Taylor, to put me right. Cllr Taylor of course confirmed that county councillors did have a vote. Cllr Dryden approached us and asked what we were discussing. I said, gesturing to Cllr Carter: “She didn’t vote on the police priorities, I was asking why not”. Cllr Carter then accused me of being “very rude”. I asked her if this was her first meeting; she replied to say no. (Turns out she was first elected in 2001) I asked her if she would be voting on the policing priorities next time they came up and she replied: “of course I will”. Cllr Carter did not speak at all during the 2.5 hours she was at the meeting, not contributing on policing item, or on anything else. All other councillors present took part. Having not attended a police priority setting meeting for two years it is not surprising she’s forgotten what her role is in them! Setting a clear time-slot for the police priority setting item; so those interested in other items don’t have to sit through it, and people who want to come for the policing bit can do so without thinking they might have to sit through lots of tedious debate before it is reached. Publicising the priority setting meeting better; and even publicising the fact local councillors set the priorities – as this isn’t universally known. Crime and traffic accident related injuries. Breakdown of the violent crime figures. Details of vehicle crime, speeding etc. as requested by councillors. Sentences handed down by the courts. Police numbers, rotas, beats etc. (So we can see if the place is flooded with PCSOs at 9am on a Monday morning, but understaffed on a Friday night for example). I think the chair should have prevented Cllr Stuart from raising an individual case. (Cllr Stuart should have known better herself). When present proactively introducing the representative from the Police Authority (and all other police related personal present) so questions can be directed to the right people. This entry was tagged mini-moto, Police, Police Authority, South Area Committee on July 12, 2011 by Richard Taylor. Nice to have this recorded. I have seen some great officers doing this in Petty Cury. Bad cycling, cycling on pavements etc is getting seriously worse in the last couple of weeks and they virtually all have the yellow sticker of Cambridge Cycle Hire on them. In my experience it’s often particularly bad in some areas in the summer, perhaps because the city gets more visitors who aren’t confident using the roads or interacting with other traffic, whether cyclists or motor vehicles. Certainly Cambridge has a rather different cycling culture to most places, largely due to the critical mass of bike users the city has. Many visitors seem to either lack the confidence or the concentration to deal with this. That said, of course, there’s plenty of people who reside in the city normally who cycle badly and very many students. Cycling competency and etiquette is definitely a problem, but it’s not one that’s easy to address – since there’s no compulsion to demonstrate competence and the people who will do voluntary courses to do so will tend to be reasonable cyclists anyway.